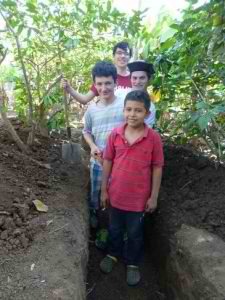 Compas has been installing gray water systems for families in La Paz. One of the biggest causes of sickness in Nicaragua comes from dirty, household gray water that cause skin infections, common colds and that create breeding areas for mosquitoes. The gray water systems not only eliminate dirty water from backyards, but also include a roofed area for washing clothes and a cement floor shower for each family. The systems consist of a 3 inch PVC tube with small holes on each side that is buried in a small ditch filled with crushed rock. The water from sinks and showers is then drained underground and filtered through the crushed rocks. These inexpensive and easy to assemble systems eliminate standing gray water in backyards and streets. 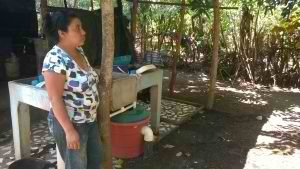 ​Maria Vega , beneficiary of a gray water system, said that the project has been a blessing for her family. “The most important thing is it removes all the dirty, gray water from our yard. The children would sometimes play in it, and also it was where many mosquitoes would breed. Now we have less mosquitoes. We also now have a new cement floor wash area and shower with a new roof. This is a blessing for our family.” she said.